Over the last few years, we’ve discovered that startups are not smaller versions of large companies. The skills founders need are not covered by traditional books for MBA’s and large company managers. There are now a few books that specifically address founders needs. Alexander Osterwalder’s Business Model Generation is the first book that allows you to answer “What’s your business model?” intelligently and with precision. Make sure this one is on your shelf. Osterwalders follow-on book Value Proposition Design describes how to get product/market fit right. It’s another “must have” for your bookshelf. Eric Ries was the best student I ever had. He took the Customer Development process, combined it with Agile Engineering, and actually did the first implementation in a startup. His insights about the combined Customer Development/Agile process and its implications past startups into large corporations is a sea change in thinking. His book, The Lean Startup is a “must have” for your shelf. Ben Horowitz’s The Hard Thing About Hard Things is a series essays about what CEO face in the “Build” phase – the transition from searching for a business model into a company. It’s impossible to implement any of this if you don’t understand Agile Development. Extreme Programming Explained by one of the pioneers of Agile, Kent Beck, is a great tutorial. If you don’t understand Values, Principles, and Practices in XP it makes Customer Development almost impossible. If you’re in a large company, The Other Side of Innovation makes sense of how to actually insert innovation into an execution organization. If you’re starting a medical device company Biodesign: The Process of Innovating Medical Technologies is a must have. It has a great customer discovery process. Talking to Humans is a great simple primer on Customer Discovery. The Marketing Playbook gives marketers five strategy options, teaches you gap analysis and offer tactical marketing campaign advice. Do More Faster identifies issues that first-time entrepreneurs encounter and offer useful advice. Getting Real is web-focussed. Wasserman’s Founders Dilemma is essential reading to building a great startup team. These books are classics but timeless. The Entrepreneurial Mindset articulates the critically important idea that there are different types of startup opportunities. The notion of three Market Types springs from here and Christensen’s work. 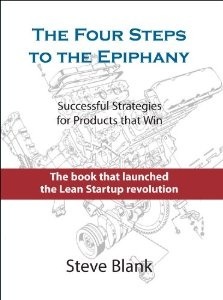 The book provides a framework for the early marketing/sales strategies essential in a startup. Delivering Profitable Value talks more about value propositions and value delivery systems than you ever want to hear again. However, this is one of the books you struggle through and then realize you learned something valuable. Schumpeter’s book Theory of Economic Development is famous for his phrase “creative destruction” and its relevance to entrepreneurship. Peter Drucker’s Concept of the Corporation was the first insider's view of how a decentralized company (GM) works. His Practice of Management defined “management by objective” and Innovation and Entrepreneurship is a classic. While written for a corporate audience, read it for the sources of innovation. If you write software you already know about Fred Brooks classic text the Mythical Man Month. If you manage a software company you need to read it so you don’t act like Dilbert’s pointy-haired boss. Peppers and Rogers, The One to One Future opened my eyes to concepts of lifetime value, most profitable customers and the entire customer lifecycle of “get, keep and grow.” Bill Davidow’s Marketing High Technology introduced me to the concept of “whole product” and the unique needs of mainstream customers. Michael Porter is the father of competitive strategy. His books Competitive Strategy, Competitive Advantage, and On Competition are still the standards. Delivering Profitable Value – Michael J. Lanning.